This skirt is not intended to conform to the realities of fabric. Paperdolls 1, real life 0. In any case, it reminds me of poor damned Linnetta, possibly because of the pale vermilion and sunburst yellow. (How impossible is that dress, too? Paperdolls 2, real life 0. Still one of my favorites, improbable or no.) In my imagination, she and her sisters are still bound to the Devil, and he’s never short of jobs for them. She can wear this, then, but I doubt it would give her much pleasure anymore. Lordy, this is gorgeous. I think this is one of my favorite gowns yet. It’s so unbelievably good to have you back, Liana! I love this colour combination soo much. But I think it could be possible if there was something like a modified hoop skirt underneath or that stiff net like stuff underneath. What great dresses to come back with! I love this so much. Who cares if it’s impossible? I have to go to work in a few minutes (unfortunately) – and I thought I’d just pop on this site to see if there was a pretty dress to make me feel better and more motivated…Thanks Liana, this one worked! These two dresses are close to being my favourite ones of all time! They are beautiful and amazing and I dont care if this one wouldn’t work, we can all imagine it being real! As one of the rare people who still sew (hahaha I bet a bunch of YOU do though) you can stitch the fabric together diagonally to create some of the folds drawn. It’s very possible. getting back on the job I see! I have my own paper doll blog! Vee’s paper dolls! Why don’t you check it out! I love this dress, especially that little belt with the blue stone. makes for a nice accent. 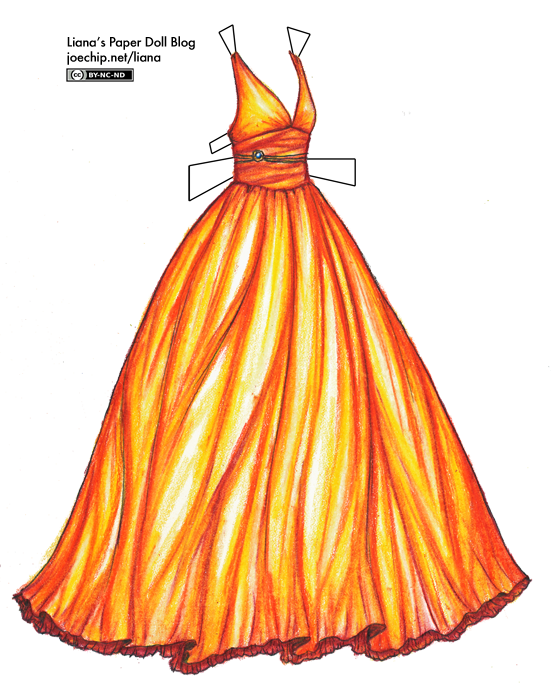 Though I believe I would have an easier time with this fire dress than http://www.joechip.net/liana/2009/09/25/strapless-fire-gown-in-orange-and-red/ your previous one. Yay! i can put your website back on my bookmarks cuz whenever i looked at it cuz i was sad there werent any dresses. but yay! Actually, this dress might not be as hard as you’d think. Get some nice light silk chiffon, have it printed with those firey streaks, put a few layers of it in, pleated at the waist, with an old fashioned crinoline (like so: http://www.farthingales.on.ca/images/cage_crin3.jpg ) under it, and you’d probably get something very much like your dress. You are the most amazing artist I’ve ever seen and I think you would love these books called the Hunger Games. They have amazing oppertunities for new dresses and perhaps a new doll. Wow, this is amazing! This is exactly like what I imagined Katniss’s dress to look like in “The Hunger Games”.